Stainless steel: those two alliterated words can mean many things to many different people. If you're a chef, stainless steel elicits images of gleaming kitchen knives that can bifurcate a shin of beef in one fell swoop. For the handyman, stainless steel comprises the nuts and bolts that hold the construction industry together. Within the milieu of the science teacher or lab assistant however, stainless steel can only mean one thing: a gleaming laboratory, kitted out with polished stainless steel worktops, cupboards, sinks, splashbacks, drainers and insets for as far as the eye can see. That stainless steel should be the de facto sink material in modern laboratories across the country should come as no surprise. Imagine a glistening, state-of-the-art lab and the first image that comes into your head will likely be whiter-than-white lab-coated technicians bustling about, fiddling with test tubes and squeezing pipettes against a clinical, steel backdrop, with nary a blemish or spillage in sight. When creaking old school laboratories are finally given a long-overdue refit, they don't replace those wooden worktops and alloy taps with like for like - no, this time around, it's stainless steel worktops throughout. While food technology labs can get away with cheaper, 304-grade steel sinks, for most labs, 316-grade steel is desired. 316 is made with a more corrosion-resistant alloy, suited to resisting the sort of hazardous spillages that are inevitable when experiments go awry and corrosive chemicals are spattered across the lab like confetti. If you have trouble distinguishing your stainless steel grades, incidentally, just think of them as area codes, the sort that are often flaunted in gangsta rap: the crew from the 304 look up to the 316 posse because the latter are tougher and handle a lot more chemicals. Resistant to chemicals, durable and easy to clean, it's easy to see why stainless steel sinks belong in the lab - not least in the sink and splashback area, where much of the hazardous action unfolds. When it comes to the serious matter of lab sinks, it's surprising to learn that some companies are still specifying units made of lesser, arguably inferior materials. What is this heresy? The names of the offending materials in question are epoxy resin, polypropylene and ceramic; hardly the sort of names to inspire confidence. Put it this way, you wouldn't name a rock band Epoxy Resin, would you? 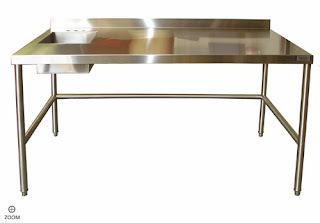 Stainless Steel, however, is an obvious contender, eliciting images of hedonism, decadence and molybdenum. Epoxy Resin sounds like the sort of wimpy school kid that Stainless Steel would bully for its lunch money. To give epoxy resin its due (demoted to lower case now that the rock analogy has been flogged to death), it does have one thing in its favour when it comes to creating lab sinks: it can be extensively customised, making it ideal for fitting into bespoke laboratories. Is this evidence of epoxy resin fighting back, and finally triumphing over stainless steel? Sadly, no - once again, epoxy resin takes a pummelling from its stronger, sleeker big brother. Steel, in spite of its unyielding reputation, is surprisingly easy to work with. So easy, in fact, that it trumps epoxy resin, polypropylene and ceramic lab sinks in the customisability stakes. You want the sink in your marine lab to undulate like the waves of the sea? You got it. You want the splashback attached to your sink to run the length of the worktop so you can let the petri dishes stack up? No problem. Ask steel - or rather ask its manufacturer - nicely and you can have your lab sink any way you want it. One of the most obvious reasons why steel - most notably its 316 incarnation - is so popular in the lab is due to its imperviousness to hazardous chemicals. If you like to get creative in the lab (and by 'creative' read 'messy'), steel can handle it. When you've done your worst, just give it a wipe down and that steel splashback should come up smelling of roses, or whatever scent your preferred detergent is laced with. Epoxy resin also performs admirably in the chemical-resistance stakes, it must be said. However, this polymer also costs significantly more than stainless steel - an expense that may be hard to justify in an era of ever-tightening budgets. 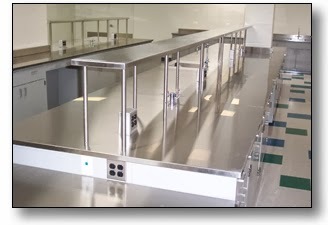 With Stainless steel sinks typically costing less than epoxy or stone, it's easy to see why metal is the medium of choice within educational laboratories. That steel happens to look good naked, spread out across the lab worktop, is pleasing, but hardly of prime concern in this setting. When it comes to fitting laboratory sinks, form and function are paramount - aesthetics are ejected into the fume cupboard. Laboratory Sinks in Domestic Homes??? Stainless steel sinks are also becoming a common sight in domestic kitchens, albeit not on the grounds of the metal's imperviousness to chemicals. The worst that most kitchen sinks have to deal with is the occasional spot of drain cleaner poured down them, or flat coke at a push. In reality, the average kitchen sink is unlikely to be having aggressive chemicals poured down it on a regular basis. If it is, that'll be cos it's being used as for questionable purposes. That being the case, the fragility of your mixing sink should be the least of your problems - it's the cops you should be watching out for - the sink will just have to fend for itself. With stainless steel bearing the brunt of your exuberance, your stainless steel sink can be easily wiped down. Give it a once-over with a cloth and your sinks and worktops will be as good as new, ready to face another hard day of potion-making in your state-of-the-art lab. Samuel Davies is an expert in Stainless Steel Fabrication with extensive experience in manufacturing Bespoke Stainless Steel Products, and is the author of this article about Laboratory Sinks. 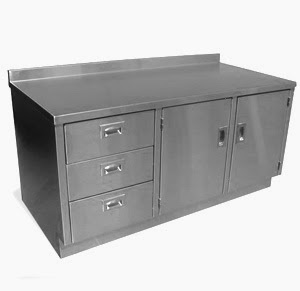 To find out more about Laboratory Sinks, or Stainless Steel Worktops, or enquire about designing your own stainless steel laboratory furniture, visit this website at www.dsmstainlessproducts.co.uk.